"Lovely Lemon Sorbet to cleanse your palate after a meal!" In a pitcher or bowl, stir together the lemon syrup with peel, lemon juice and mineral water. Pour into an ice cream maker, and freeze according to the manufacturer's instructions. Garnish each serving with a twist of lemon peel. 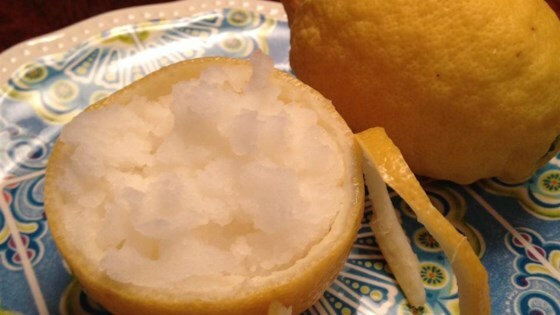 See how to make this Italian-style lemon ice without an ice cream maker. This turned out really great. I used lime flavored carbonated water and strained out the lemon zest. It doesn't make a whole lot, you may want to double the recipe. I thought the original recipe was way to sweet. I doubled the amount of carbonated water to 1 cup and it was just right. Other than that it was very good. Nice and lemony. Fabulous. I thawed, processed, and strained a bag of frozen raspberries and added it to the mixture before freezing. Tasted like raspberry lemonade! Excellent and truly refreshing! I used Lime seltzer water and it was perfect. The fizz gives it a nice kick to the palate. I definite must for the summer!